On Saturday, February 25, 2017, the weather was pleasant, mild—certainly not your typical winter day in Cleveland, Ohio. However, for 10 high school students and an audience that included their family members and teachers who gathered at the Cleveland Public Library, the day contained just the right atmosphere for an exceptional event. To view/print/download the program, click on the image above. The Ohio Center for the Book at Cleveland Public Library (OCFB), in partnership with the Ohio Arts Council, is pleased to announce regional finalists for the 2017 Ohio Poetry Out Loud poetry recitation competition. 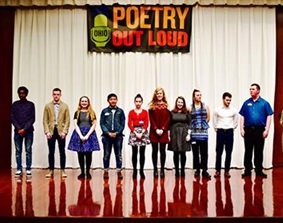 Three students have progressed in competition at the Northeast/Cleveland region and will represent their schools and communities at the Ohio Poetry Out Loud State Finals on Saturday, March 4 in Worthington, Ohio. The Ohio State Champion will then advance to the National Poetry Out Loud Finals in Washington, DC, which will be held April 24-26, 2017. PRIZES: The winner at the state level will receive $300 and an all-expense-paid trip to Washington, DC to compete for the national championship. The state winner’s school will receive a $500 stipend for the purchase of poetry books. Two runners-up will receive a cash prize for themselves and for their school libraries. Additionally, a total of $50,000 in awards and school stipends is given annually at the National Finals, including a $20,000 cash prize for the Poetry Out Loud National Champion. Chiquita Mullins Lee, Arts Learning Coordinator, Ohio Arts Council and Kisha Nicole Foster, OCFB Poetry Out Loud Fellow. Thanks to all of this year’s competitors, and good luck to all finalists!